An enthralling read. One of the best books of 2004! Welcome to The Time Traveler's Wife bookring. On its way to UrbanSpaceman in London. Just arrived from Carol1. I'll be as quick as I can! This was a beautful, poignant and inventive story full of humour, romance and sadness in equal parts. I think I'm going to be haunted by it for some time to come. Will send it on to nice-cup-of tea tomorrow. Just received this today from Urban Spaceman - will read & report back! I'm sitting at my desk, having just finished reading "The Time Traveler's Wife" and I feel almost wordless; I can't remember the last time a book genuinely trapped me so completely. The narrative holds you fast, and you read hungrily to see how the narrative pans out. As the chapters fall away, you can sense the resolution and you start to prepare for it, but the ending still creeps up on you. Despite the tear-jerking and heart-wrenching nature of the story, did you find the novel was also positive and uplifting in some way? Or did you find it unremittingly bleak? As with all questions of this type, the answer is somewhat ambigous, there are no clear certainties! Certainly the novel revolves around a main axis of themes: loss, death, grief. The time traveller's wife has to wait, and deal with the repeated loss of her husband; and she deals with the loss of other loved ones. 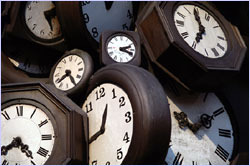 However, alongside this experience of loss comes a realisation and understanding that love, happiness, life are to be experienced in the here and now, that there literally is "no time like the present". I think that this is an idea that we have forgotten in today's world, we hope and worry about what is to come; we regret and fear the past; and we fail to appreciate the life we currently live. I think it is also noteworthy that Henry and Clare are both artists in their own way, entranced by words and book and paper. Other main characters are motivated by music. This reminds us I think that art (with a capital A!) is timeless and has the capacity to teach us about the world. I think that Niffenegger uses the quotatations, particularly Rilke's poetry, to highlight this. Our sense of loss and beauty and emotion are not just experienced by us, they are universal. Arrived this morning. Can't wait to start this one. Wow. Stunning. I kept finding my mind straying to Clair and Henry throughout the day and I cursed the fact that the kids were all on holiday, because I longed for the chance just to curl up in a chair with this book and read it right through. Ahh, I think this is the third ring to arrive this week. However I hope to finish all my coursework next week so I will then be concentrating on reading. I'm really looking forward to reading this book as I've heard lots of good things about it. Despite finding the book confusing at the beginning, with the changes in age, I really enjoyed it. I started to believe in Harry's illness, Chrono-Displacement Disorder, and have spent a lot of time thinking about what it would be like to time travel in such a manner. Although it is intriguing I don't think the lack of control would be nice. I love the concept of the book and think it is one of the most original I've read recently. I would like to know how the author thought of it. My only dislike of the book is I think it was too long; I was getting bored towards the end. 100 pages less and I think it would have been 10*s.
Received this yesterday from akg, and reading it already. And I love what I've read so far :) More detailed entry coming when finished. On its way to teachie now. Enjoy! The book arrived this morning.What a super idea to put starting points for discussion at the front, and a matching book mark! I am off on a 3 hour car journey tomorrow with husband doing the driving, so an ideal time to start reading it, can't wait. I will journal my thoughts when I have finished the book. I think this is by far the best book I have read this year...the speed it was read in shows that, read in 2 days! I think that the way this is written is very convincing, his illness is very believable. I certainly didn't find the story bleak. I thought Henry was very tender and protective with the young Clare and the older Clare reciprocated after she was married to Henry by not telling him things he hadn't yet found out in his life about their relationship. His dying was a real tear-jerker, had to try hiding the tears as we were driving back down the M6 with the hood of the car down at that part of the book. I didn't want the story to end. Caro1 - you were right, I was due another one of your bookrings! This was waiting for me at home when I got back from the meet! Thank you! I really enjoyed this book, and read it in two days. It only gets an 8 because of the ending and a couple of inconsistencies - generally, it was a believable and plausible account of time travel - rather better in that respect than "Do You Remember the First Time" another time travelling book I've read recently. Although the book is suffused with a sense of grief and loss, the powerful love between Clare and Henry made it uplifting and positive. To me, I thought the book was an allegory on the nature of memory. Although we live in a chronological, linear way, our memories don't. For example, at any given point, I can imagine say my father anywhere between 30 and 64, and because of his stories, and old photographs as a child or a young adult too. And these stories are part of my reality even though chronologically I couldn't have been there. Thanks Caro1 for another fascinating book - I think I'm going to sign up to all your rings because they are always interesting reads! Will PM Tiggsybabes to see if she wants me to post the book or hand it over at the next Sheffield meet. Beautifully written book. It didn't reduce me to tears, but the ending was very poignant & made me stop & think. I would love to be loved as much as Clare was, it must have been wonderful to have kept her going nearly 50 years on her own waiting to see Henray again. Passed back to me by tiggsybabes at the Sheffield BXers meet, so I left it to continue its journey. Thanks to all who participated in the ring, I'm pleased it received such positive comments. Picked up at yesterday's Sheffield meet. 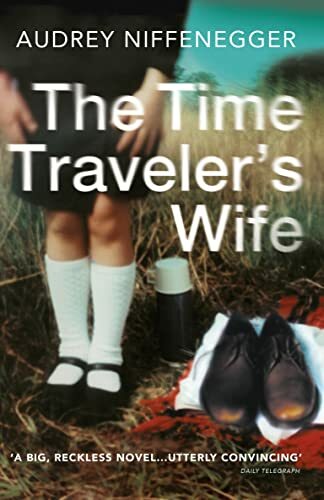 I lent "The Time Traveller's WIfe" to my mother and she has just given it back to me, saying that it is a very interesting book. But I still don't fancy reading it myself, so I'll be taking it to the Unconvention next weekend. Picked up at the BC UK 2006 Birmingham Unconvention specifically for release in the Plymouth Hudsons OBCZ (because it's such a great book). It's *marvellous* to be able to release a book with such great history.